In 1958, a young CEO named George Romney decided to kill off the Nash and Hudson brands in order to save American Motors from extinction. AMC’s car line was too outdated to keep pace with the big three automakers, so Romney spent what little money the company had, to develop a new compact car called the Rambler. Because the Rambler was based on an old Nash design, this left AMC with plenty of money to advertise the virtues of owning an economy car. By 1960, the Rambler was the third best-selling car brand in the United States, and Romney had become a household name in the process. Prior to AMC, no automaker had ever used their CEO as the public face for the company. This shrewd PR move allowed George Romney to convince Americans that his new Rambler was far superior to those “big, bulky, gas-guzzling dinosaurs”, which ironically earned him the nickname ‘dinosaur hunter’. Sales continued to soar, and Motor Trend described the 1963 Rambler American as “a straightforward, proven design with no nonsense - something for everyday folks.” More than 50 years later, a PR consultant named Suzy Bauter decided to buy a 1963 Rambler American 440 Wagon, and now she’s on a mission to convince people that a Rambler can outrun the dinosaurs on the autocross circuit. As a little girl in San Mateo California, Suzy liked to hang out and watch her brother and his friends work on their cars. She took auto shop in high school but wound up with a finance degree working on Wall Street. Years later, she changed careers and started doing PR in the oil and gas industry. “I wanted a change, and I thought that PR would give me more time at home. But it really didn't.” She said. 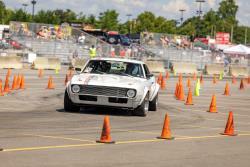 A few years later, her husband Rodney Prouty started competing in autocross events on the weekends, and Suzy would help him work on their 1968 Camaro. It didn’t take long for her to get hooked on the sport, and soon she was competing alongside her husband. “At a recent Goodguys event, Spectre had tents for us to pit at and a big barbecue for everybody"
Suzy decided to replace the AMC straight-6 with a Chevy 5.3L V8, which she tuned to produce an estimated 360-hp. 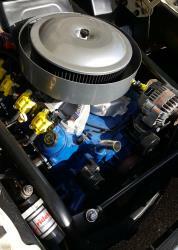 Some of the modifications include a Spectre fuel rail, fuel regulator, crank case breather, and a high-flow intake system. That’s backed up by a modified 700R4 transmission with a TCI Autocross valve body, and the whole drivetrain has been moved back into the firewall 7-inches to achieve better weight balance. Underneath, she and Rodney welded in a first-gen Camaro front subframe, complete with a custom suspension from Suspension Geek. A fifth-gen Camaro independent rear suspension and differential were used out back. And all four corners will be getting big Baer Pro+ 6P brakes, Viking adjustable coilovers, and 18x10.5 US Mags wheels wearing sticky BFG Rival S tires. Because of the wide tires and suspension setup, significant fender flares had to be added. This will result in an aggressive Pro-touring look, which will be set off by a custom color scheme by Best of Show Coachworks. And since, as Suzy put it, “There isn't a single aftermarket thing for a ’63 Rambler wagon,” she’s adapted universal-fit components from Spectre, including the front spoiler, door handles, and the throttle cable. 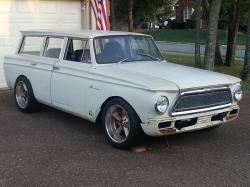 Thanks to its sub-3,000lb curb weight, low center of gravity, and autocross tuned suspension, the Suzy Bauter 1963 Rambler American 440 Wagon SEMA show car should be a serious contender when she begins campaigning it in SCCA Solo, Goodguys AutoCross, and Optima Autocross events across the Southeast and Midwest. We at Spectre can't wait to watch Ms. Bauter become the next 'Dinosaur Hunter' on the autocross circuit later this year. In the meantime, go check out her '63 Rambler Wagon in the Spectre Performance Booth at the 2017 SEMA Show in Las Vegas, Nevada.